I Went to the Budget Hearing, and It Was Awesome. Last night was the first time I’ve ever attended or spoke at a local representative listening session, so I’m including this breakdown for people who want to know more about the experience. Basically the set up, but with only Senator Risser and Representative Berceau, and with a wall as the backdrop. We all sat in chairs in front of them. Image via Fred Risser’s facebook page. People from all districts can attend. I live in Fitchburg, as did at least one other person there. Someone came from Whitewater. We were all heard equally. If you aren’t comfortable speaking, you can silently register in support of your cause. Just as at county board hearings, you fill out a sheet indicating whether you are in support or against, and whether you want to speak. For this hearing, there was an additional line to write what part of the bill you’re for/against. I sat next to a board member who chose not to speak, but wrote down the UW open records exemption as what she was against. At least one other Alliance member was there and did the same. It’s a great way to get your voice heard without speaking, and to bring attention to specific items. You can come any time during the session and still register to speak. I got to the library around 4:15, and the doors opened just slightly before 5. When we first started the session, there were 8 people signed up to speak. By my count, 21 people spoke before the night was through. The people who speak are not polished speakers. If you’re a woman (cis or trans), under 45, or a person of color, your voice is woefully underrepresented. As a side note, the Alliance can learn something from this demographic inequality. “We wonder why we mostly have financially stable white people at our meetings, and yet we don’t offer transportation, childcare, or a free meal. The hearing offered none of those things. One of the speakers was a woman with developmental disabilities whose paid transportation had been taken away, so she had to pay a cab to even come to the meeting. I didn’t see any young children in the room. There weren’t any snacks. In addition, it started at 5, a time when many people are at work. I found it really inspiring to see democracy in action. There were somewhere between 60 – 80 people in that room, and we were a family. Senator Risser and Representative Berceau spoke kindly and candidly, we cheered each other on, and each issue that speakers brought up was thoughtfully considered. 65 people registered, all (according to Berceau) against the budget. I was amazed at the turnout – as was Berceau, who told us at the beginning, “I didn’t even expect a third of these people!” – and I was really moved by the positive energy, even in the midst of sharing grievances. It really felt like we were all in this together. I truly believe my testimony made a difference. You can make a difference a number of ways, and just one of those ways is by attending these hearings. Senator Risser told us that he believes the pendulum will swing the other way for politics in Wisconsin, but that we have to do our part. There are three things he suggested doing, all of which, he mentioned, cost no money. Thank you for leading such a positive, open, and thoughtful listening session at Sequoya Library on Monday, March 16th. It was my first time attending such a session, and I was inspired to see democracy in action. Sen. Risser mentioned that one thing we can do to improve the political landscape in Wisconsin is to thank our officials who are doing a great job. I really want to thank you both for being so passionate about what is right, being a voice for the people, and continuing to stick it out in a currently very toxic government body. 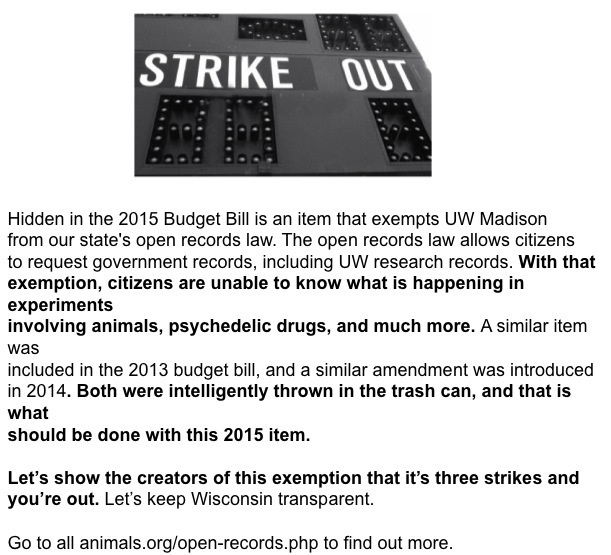 When I spoke about the UW open records request, I really felt heard, and I know a lot of other speakers felt the same way. I feel so grateful to have you fighting for us. I will continue to share my voice with my representatives, and I will encourage my peers to do the same. 2. If you know someone living in the Joint Finance Committee members’ districts, ask them to contact their representative. I’m uploading a couple of files, and one is a document with a list of the JFC members and a map of their districts. 3. Encourage people to get involved. Less than 50% of Wisconsinites vote. There are definitely structural inequalities in place, such as having voting on a Tuesday rather than a weekend, but there are also people in all of our lives who could vote and who could get a little more involved in politics. AFSCME has collected a fantastic list of the upcoming listening sessions taking place around the state. I’ve added some additional dates below the picture. 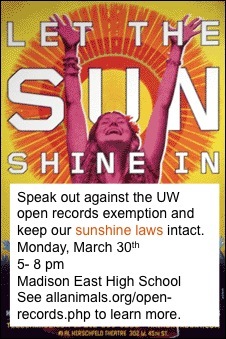 Please attend the ones you can and express your disapproval of the UW open records exemption. If your representative’s session has already passed, see our legislators page to find their contact information and email them. Please email alliance@allanimals.org with further updates. To learn more about the proposed UW exemption, read our suggested articles. All proceeds go to two very deserving organizations – Happily Ever Esther Farm Sanctuary and Sea Shepherd. 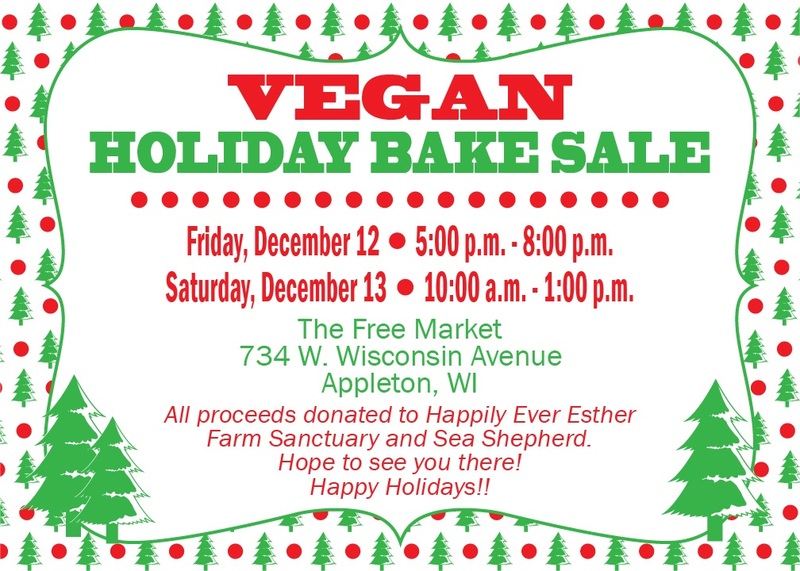 The weekend after that, the Madison Unitarian Plant Based Eating Group is having a Vegan Holiday Treats Exchange! 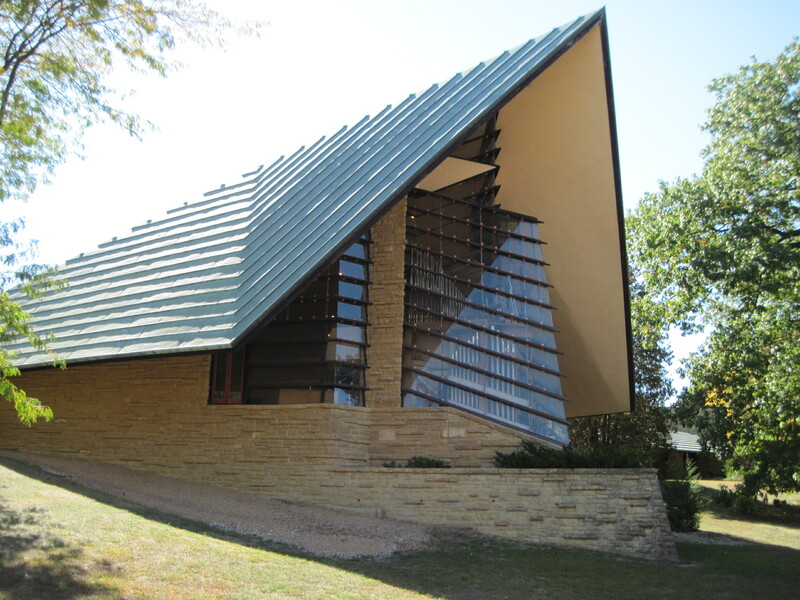 You do not have to attend services or be a member of the Unitarian Society to participate in this event. Thanks, Anna and Sara, for letting us know! Hope that many of you can make it to these two delicious events!